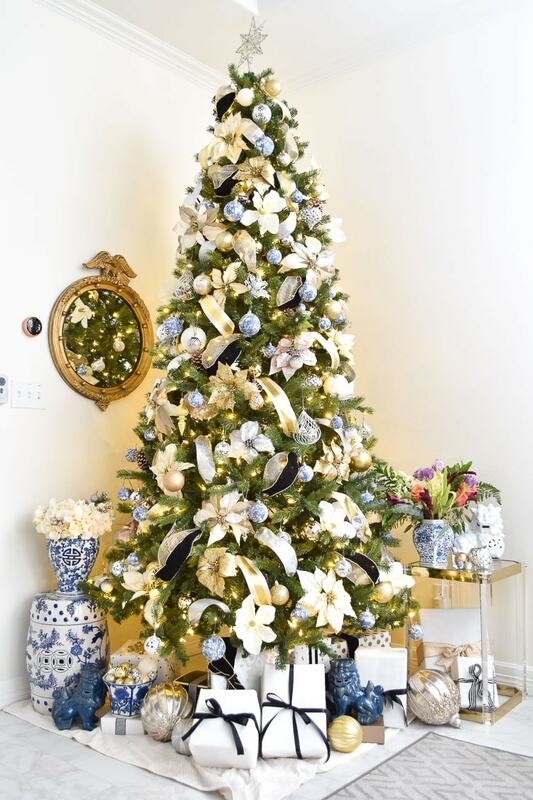 I’ve been eagerly anticipating premiering my blue, white, silver and gold chinoiserie Christmas tree decor today. 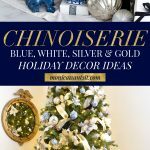 If you love chinoiserie and blue and white, this post is packed with holiday decorating ideas that are affordable and easy. I’d like to thank my friend Stephanie from Casa Watkins Living for hosting this blog, and a big hello to those of you landing here from Kathy at Up to Date Interiors! I adore Kathy’s chic, global style and she is a master at vignettes. 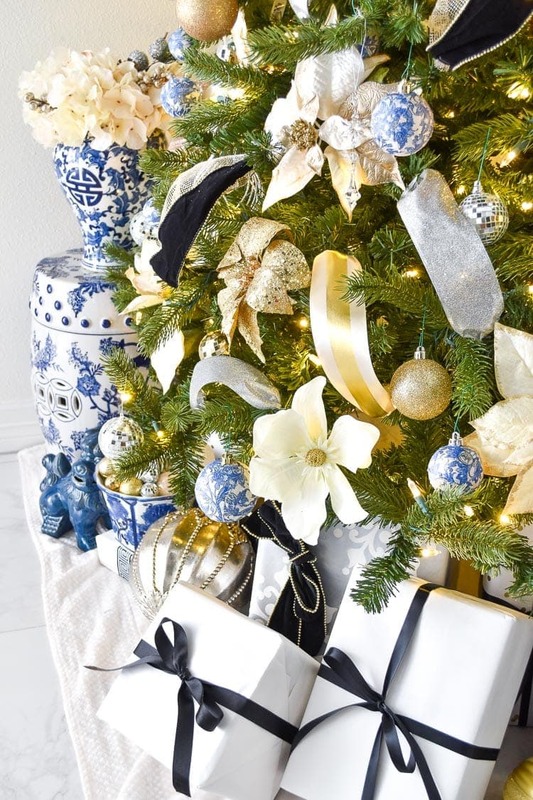 Before we dive in you may want to catch up on how to easily add ribbon to a Christmas tree and how to make DIY blue and white chinoiserie ornaments. 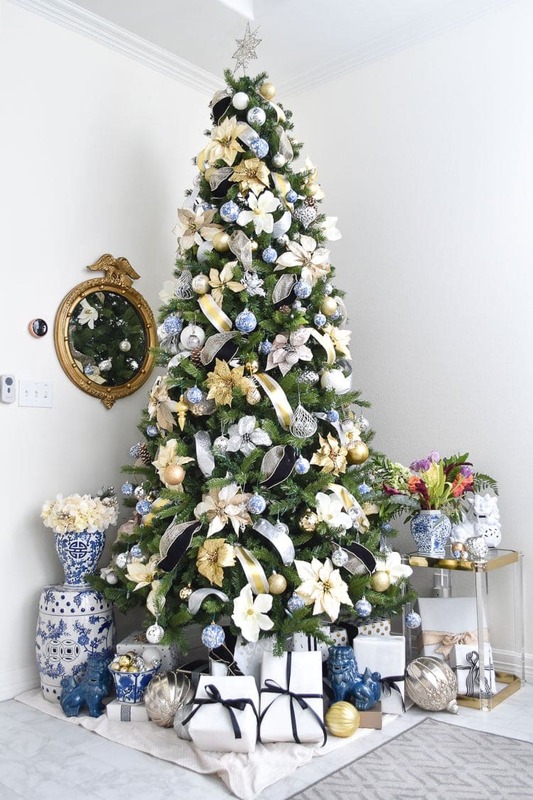 The purpose of today’s post is to help guide you lovely readers on how to achieve the look of our stylish Christmas trees. My style this year is chinoiserie, glam and floral. Let’s dive into the decor details that help create this look, and we’ll end it with top to bottom photos. 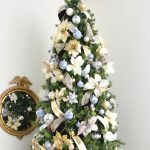 The underlying base of my Christmas tree is definitely the four different types of ribbon I weaved through the tree AND the over 30 flowers I incorporated. 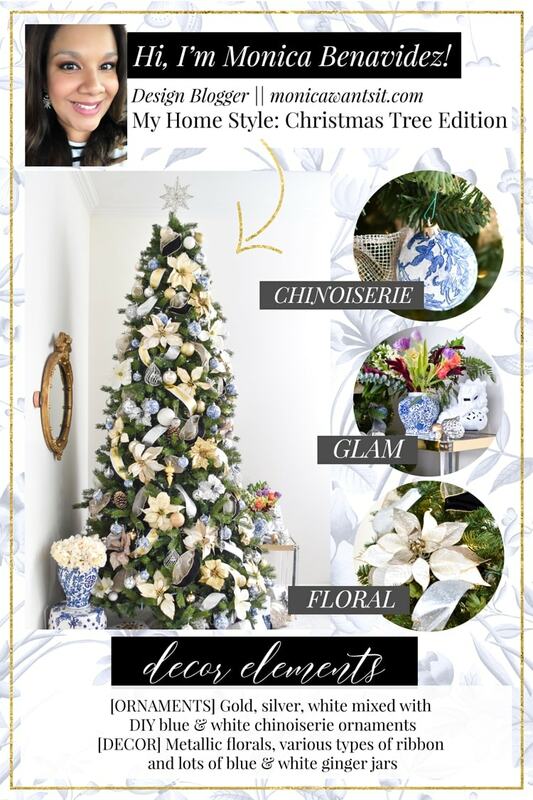 I took my existing collection of silver, white and gold ornaments and paired them with my DIY chinoiserie ornaments to bring glamour and tons of feminine florals to traditional chinoiserie. 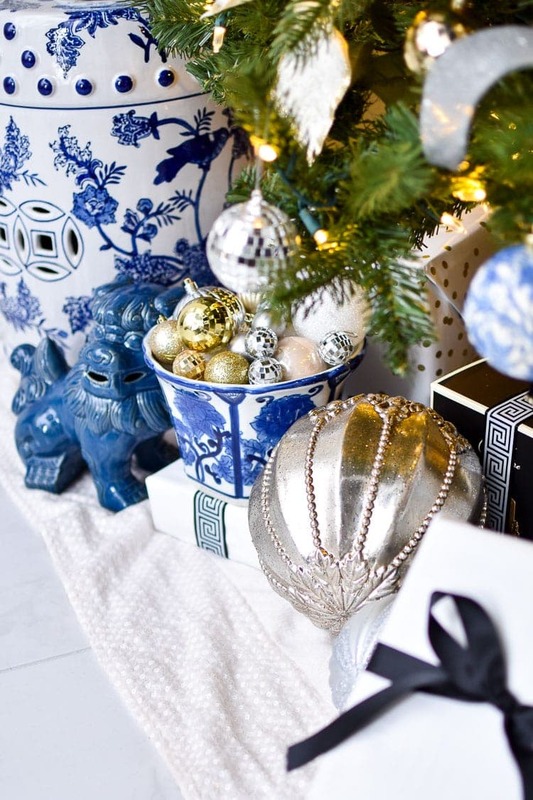 I scoured every store for the perfect shade of blue ornaments for my chinoiserie Christmas tree, and instead opted to only have the blue come in via my DIY ornaments. 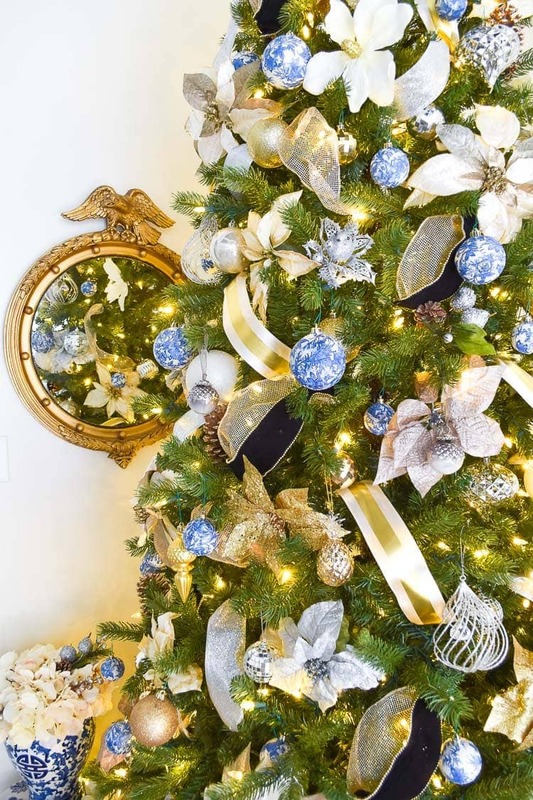 I chose to use different ribbons to add color, texture and sheen to my tree. The ribbons are gold, silver, white and BLACK. The black is a bit of an unexpected color, but I love the contrast it adds to a heavily metallic and glittery decor lineup. I also picked up a few ornaments on sale to make all my old ornaments feel a bit new and fresh. I love this “onion” shaped sparkle ornament. The shape really adds tons of glam to the tree. Another new addition to the ornament line-up is this gorgeous gold glass pineapple ornament – a preppy, chinoiserie touch. I kept the theme going under and around the tree to really make it a truly Chinoiserie Christmas tree! A blue and white garden stool holds a ginger jar with simple white hydrangeas. 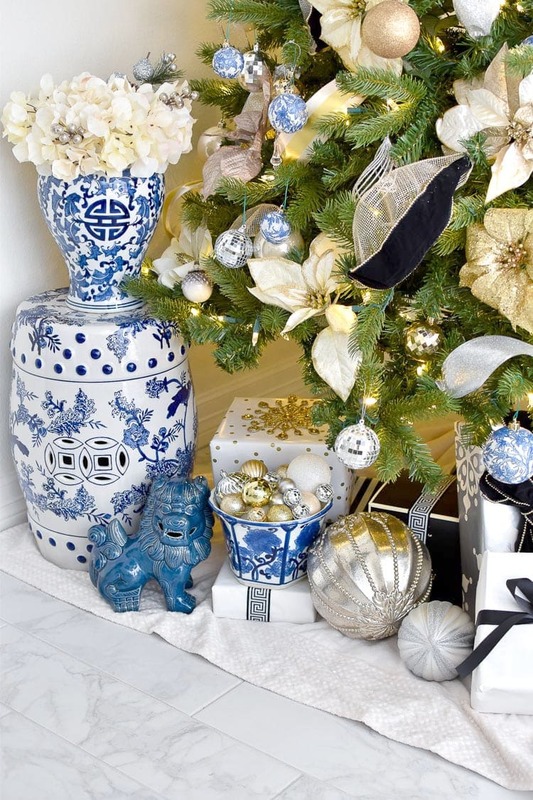 Under the tree are also some blue foo dogs and a planter filled with excess small ornaments. I rarely put away unused ornaments and instead opt to use them as vase filler. My gift wrapping is classic white butcher paper with black satin ribbon on a ivory sequined tree skirt that I’ve had for years. 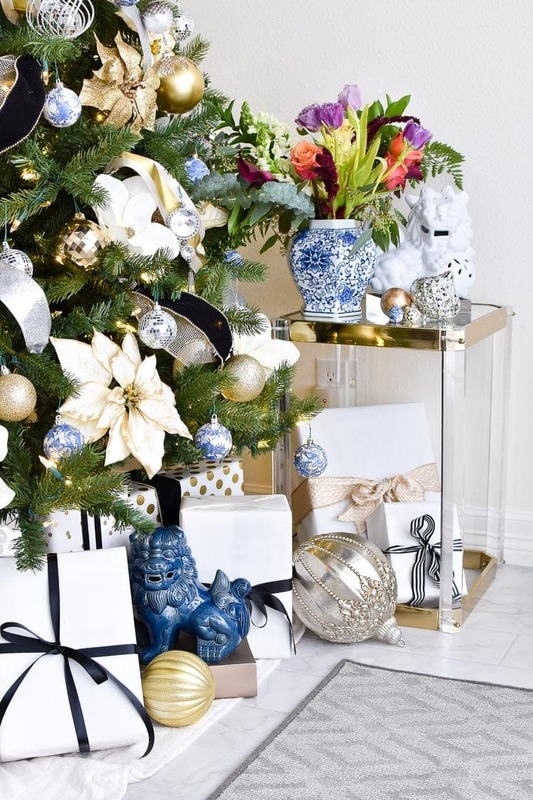 On the right side of the Christmas tree, I put an accent table that holds a white foo dog and a ginger jar floral arrangement for a fun pop of color. And here are a few photos of the tree in its entirety. Here she is all a glow in the early evening. 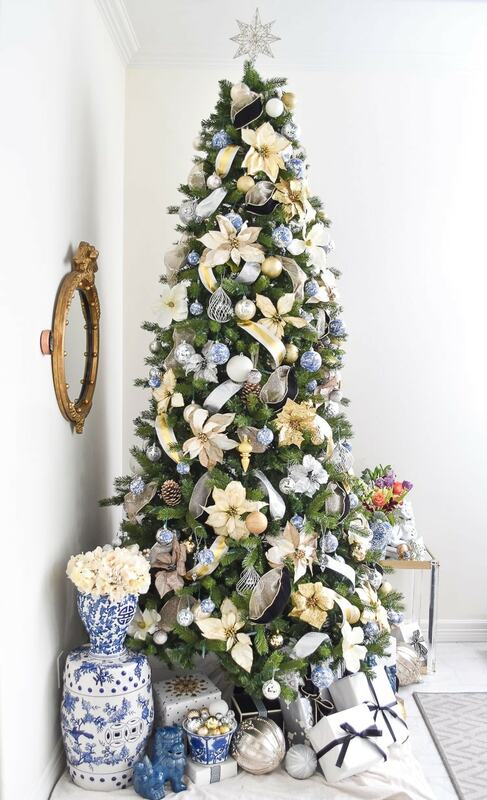 This tree stands at just under 10 feet tall with the tree topper. I think a beautiful tree is one that looks good with the lights on AND lights off. 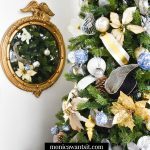 I put this small federal eagle mirror next to the tree to help reflect some light back into the living room. It’s an antique estate sale find that works so perfectly with this decor style. 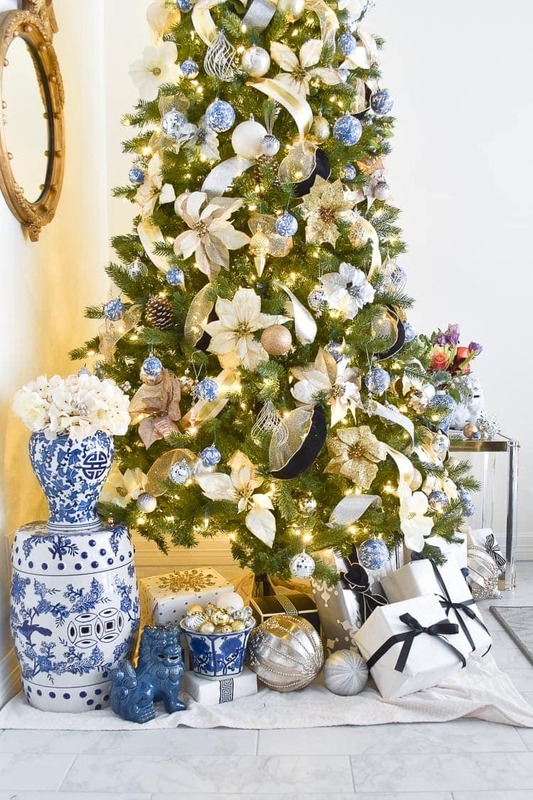 This chinoiserie Christmas tree is definitely a departure from my usual black, white and gold, but it makes my heart happy when I see it. 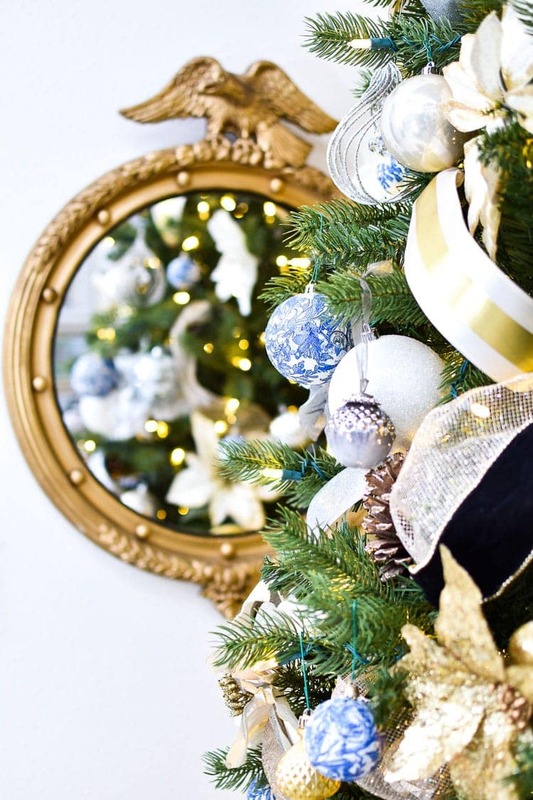 I hope you’re feeling inspired to take down your Christmas decor from the attic and get decorating! I now send you off to ever so fabulous Iris Nacole who always has crisp, bright, cozy decor that makes you want to paint all the rooms in your house white. 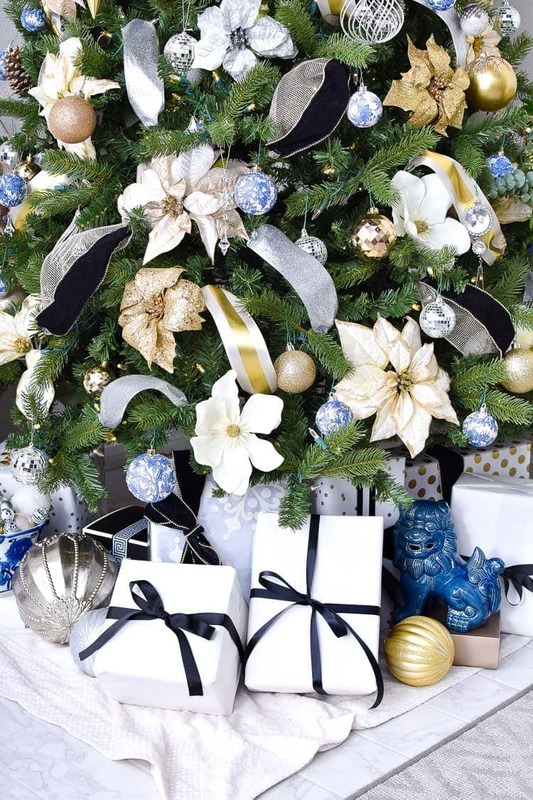 Make sure to visit the other bloggers sharing their Christmas trees today through Friday of this week! So much inspo to be had! Well shoot! Isn’t this just stunning?! All your chinoiserie touches are to die for! Wow! Spectacular use of floral, traditional, and glam! It’s absolutely gorgeous Monica! 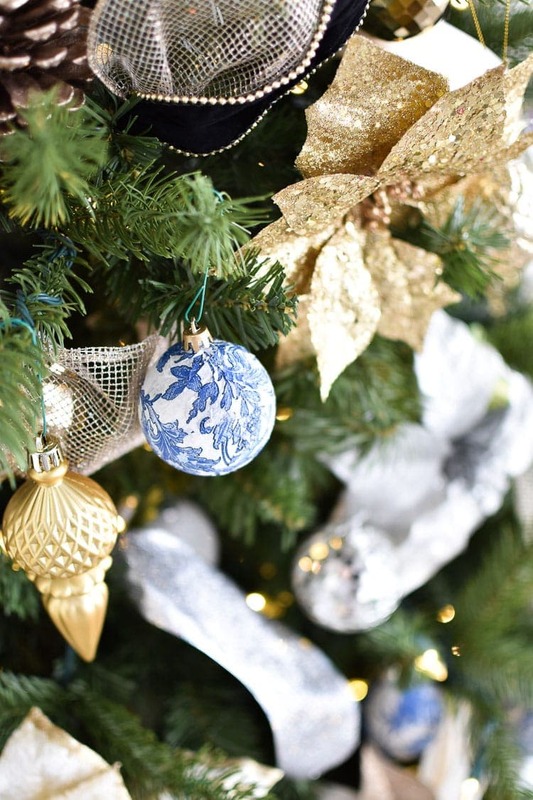 I am swooning over those diy ornaments!! I love blue and white anyday! What a fabulous tree! 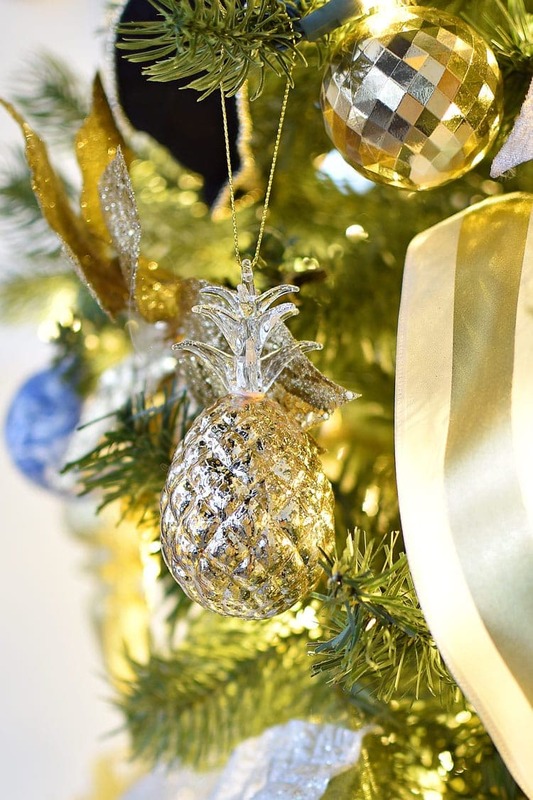 I love the blue DIY ornaments and the pineapple is adorable. I love the big ornaments on the floor as well. So beautiful. I love your tree, Monica! So classy. I FINALLY get to come see your pretty tree. So lovely and timeless Monica. Great work! I LOVE this tree and the gorgeous pops of blue! Well done. It looks great! 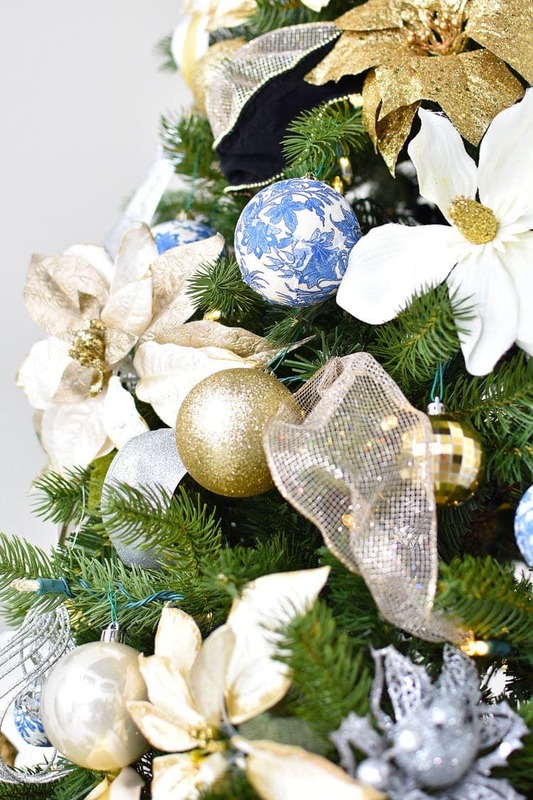 I love those DIY ornaments!! Beautiful! Monica!!! 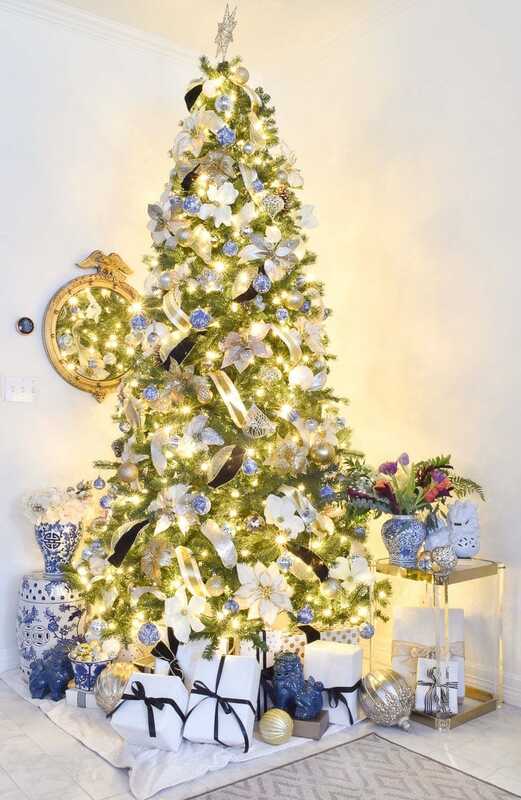 This tree and blue and white decor is right out of my dreams LOL. Of course I love everything about it! 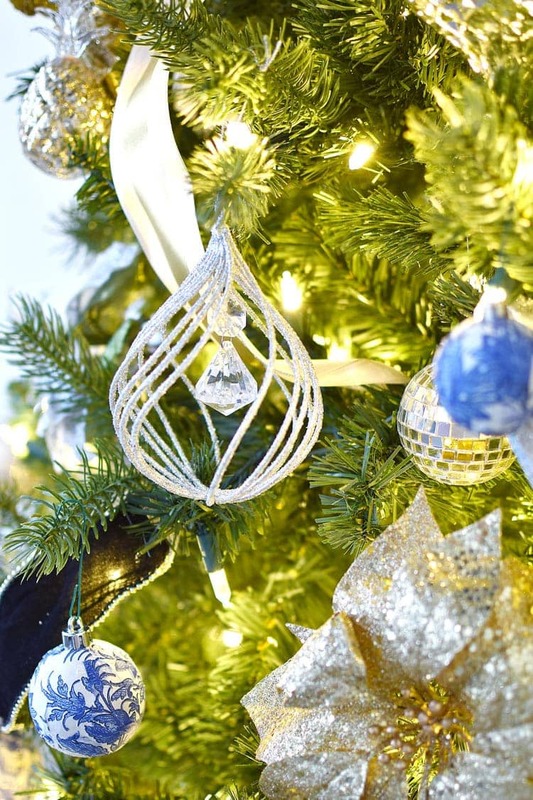 Those glass pineapple and your DIY blue and white ornaments are my fave! And I need to know what camera you use because your photos are insanely good! Wow! You knocked it out of the park! And PS, you photography gives me chills it’s so good. You rock! It’s absolutely stunning, Monica! I love the Chinoiserie theme. So unique! Thank you so much for the ribbon tutorial. I can’t wait to try it on my tree and I am expecting it will look great!! I have struggled in years past with a 30 foot roll of ribbon that never goes around the tree enough and ends up looking ragged. Your technique is going to be so helpful. Your tree is beautiful Monica. It’s been fun watching your create your DIY ornaments and seeing them come to life on your tree. Such a gorgeous tree, Monica! I love your DIY ornaments, and oh man I wish I could work with ribbon that way. I’m terrible at it. Haha! Monica, your tree is magnificent and your ribbon tutorial is amazing too. So beautifully done. It’s stunning Monica! 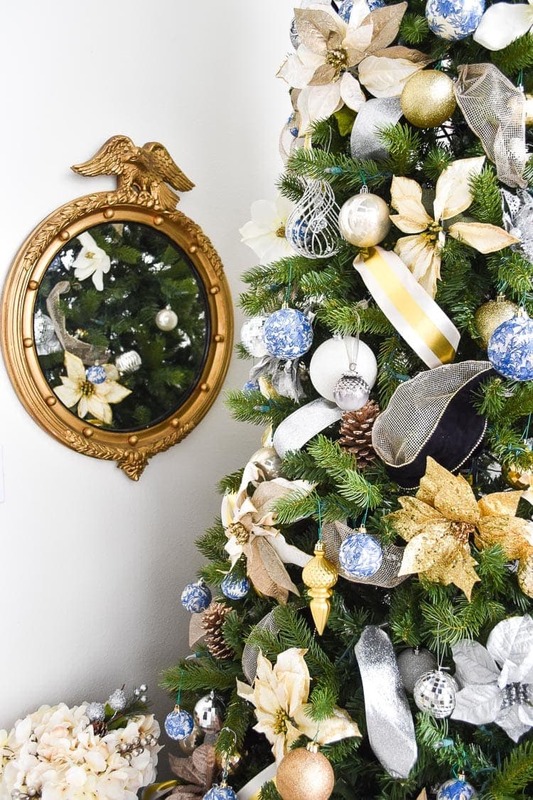 I love how it showcases your beautiful DIY ornaments and the entire vignette looks gorgeous.